Delete media, make edits or delete scheduled posts from the web or from the Later mobile app. Only future scheduled posts or posts that have not been marked "posted" and greyed out can be edited, deleted, or unscheduled. Note: You can still update the Linkin.bio links after a post has been posted! Important: Once you've deleted a post, it's gone forever! We don't keep history of your deleted posts for security reasons -- be sure you want to delete it forever! Note: Posts that are greyed out have already been posted, and can't be edited or deleted. 3. 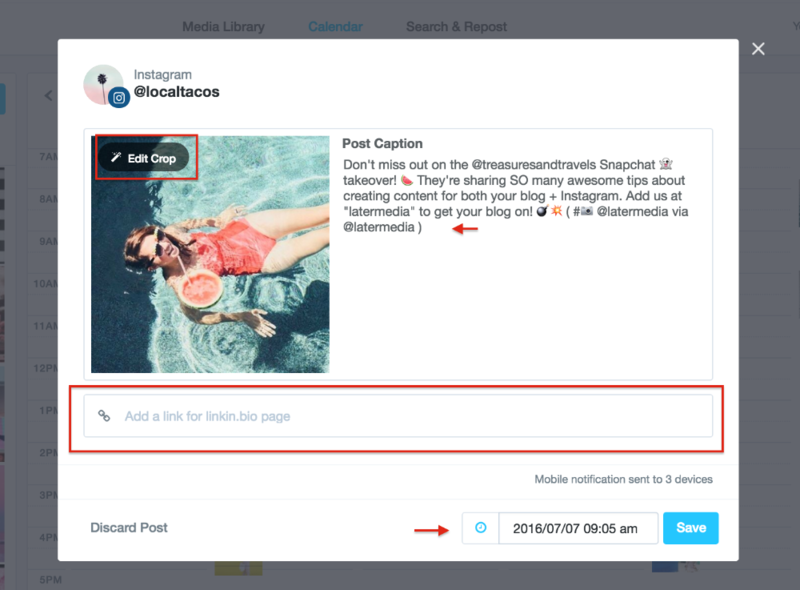 To edit the caption, make your edits and then select the checkmark at the top of the screen. 4. To discard or delete the post, click the three dots at the top of the screen, then select Discard Post.